The island is fairly small and is uninhabited, meaning that the only people there are either visitors to the island or people working in one of the hotels there. Lang Tengah Island off the coast of Terengganu is one of the nation's well-kept secrets. Its arresting beauty can easily captivate you while you are there. Crystal clear sea-water, pristine beaches and untouched tropical jungle. Its arresting beauty lingers forever in your memory. An island you can call your own, private and tranquil. There are many great outdoor celebrations. A cheerful walk along the powder white beaches will make you feel active and refreshed. Or simply get in rhythm with the chirpy sound of happy birds. The best time is between March - October and please get advice regarding the weather condition before you go. Try to avoid school and public holiday. Lang Tengah Island located in Terengganu and is accessible via Merang jetty. The journey will take approximately 40 minutes by speedboat and one and 1 � hrs by slow boat. There are boat service from Lang Tengah Island to Perhentian Island and vice versa but it�s not regular and can be expensive. 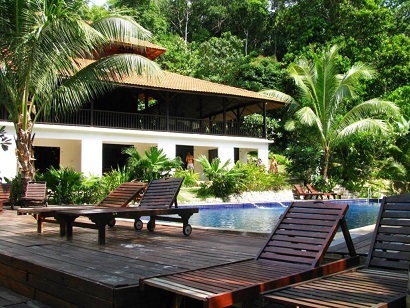 Blue Coral Island resort is situated in the middle of Malaysia's premier marine park sanctuary. The Resort is your tropical dream come true. Sandwiched between crystal clear water and hills covered with lush tropical jungle, our resort offers you peace and tranquillity like no other as the Lang Tengah island is almost uninhabited. Comfortably furnished air con rooms, nice restaurant staff (the reception staff is sour faced), well kept beach (unlike some beaches on the island which have buckets and sandals and rubbish in the water). It is right in front of a very nice snorkelling spot. Walking distance from the beach, are some rocks which u can spot turtles and baby sharks swimming there. Once you're done with the lazing, you might want to do a little swimming. You won't regret it, just remember to bring a good pair of googles to see the little gems in the water. Yup, the little fishes in Lang Tengah look like jewels, so colourful they were, in contrast against the white corals in shallow waters! You can swim with them as they don't seem to fear humans at all. The rocky shoreline is a recommended site for snorkelling. Most of the reefs are still intact due to the islands rocky nature which make this island as one of the best snorkelling spot in Malaysia. Small blue and yellow damsel fishes are common among the coral branches and colonies. 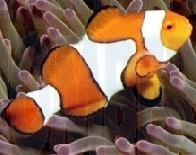 At Lang Tengah corals were very much more alive and the marine life was plentiful. Just snorkelling in front of our hotel we saw turtles and sharks. The waters around the island were an amazing blue and extremely clear. However being a coral island, much of the island's beaches are littered with dead coral, so make sure you bring suitable footwear. Lang Tengah is one of the most popular dive destinations in Malaysia. The island itself has 12 dive sites which are easy on the divers and enjoyable. Besides that, there are several spots perfect for snorkelling. If divers are interested in diving at Redang Island, it will only take a 30 minutes boat ride from Lang Tengah. 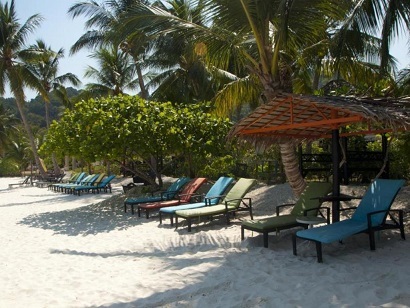 Besides the fact there is a dive resort, it also provides a relaxing paradise ambience for the guests. D'Coconut Lagoon Resort, Lang Tengah Island is a short boat ride from Merang Jetty - a charming fishing village. If you fancy staying somewhere full of some of the most beautiful wildlife in the world, Lang Tengah is definitely worth a thought. Not only will you be staying on an island with an untouched tropical jungle, but the nearby coral reefs are full of tropical fish and rays, so you can embrace the Little Mermaid/Merman from within and also take some amazing photos in the process. Guests will enjoy a prime location that is only 30 kilometers from a major shopping area, 45 minutes from the heart of the city, and 20 kilometers from the Sultan Mahmud Airport. The hotel offers unfettered beach access, providing guests with an easy route to amazing diving and snorkeling locations where a variety of native fauna can be observed in their natural habitats. The guestrooms are simple, yet elegant, and offer a full line of modern amenities. The D'Coconut Lagoon is the perfect property for guests who want a secluded and well-connected location on a tropical beach with coral reef access. Sari Pacifica Resort & Spa, Lang Tengah Island is a short boat ride from Merang Jetty - a charming fishing village. Surrounded by tropical jungles and white sandy beaches, the resort also boasts excellent diving and snorkeling sites. Villas offer private balconies, tropical views. It is a 45-minute boat ride from Kuala Terengganu. Each air conditioned villa has large windows that allow the fresh ocean breeze in. They are fitted with marble bathrooms. Activities available at the resort include water sports and beach volleyball. Guests can organize trips to nearby attractions at the tour desk. Meals and beverages are served at the resort�s restaurant and bar. Alternatively, room service is available for guests wishing to eat in the comfort of their rooms. Each villa is beautifully traditional and furnished with the latest modern features of large LCD televisions, a large contemporary bathroom in local white marble, a walk-in rain shower, and separate bidet.